Stories inspire, bring people together and break stereotypical images. Stories, therefore, are key to social change. This specific story exposes a hidden history, the history of black people in the Netherlands and in its wider context. This story is about Otto Huiswoud and his wife Hermine. Otto was the son of an enslaved African descendant. When he was sixteen he left his family and undertook a journey to the Netherlands. However, before reaching the Netherlands he stopped in New York and got involved with the communist party of America. He was one of the first black members of this party and he became a leader in the fight for equality for black Americans during the civil rights movement. Hermine was active in socialist and communist movement as well, which was how they met. During WWII, the Huiswoud’s moved to Surinam due to health complications of Otto. However, once there, Otto was seen as an enemy of the state and held captive for the period of a year. After the war, they finally moved to the Netherlands, where they used their international contacts to empower the black community in the Netherlands against racism, colonialism and inequality. Otto and Hermine were anticolonial thinkers, leaders and organisers who fought European and American imperialism on an international level. Together with George Padmore, C.L.R. James, Aimé Césaire and Franz Fanon they were the first generation Carribean Marxists, a group who saw racism and imperialism as directly connected to resistance movements in the Carribean. Although Otto became chairman of the Organisation ‘Our Surinam’ and played an important role in unifying the Surinam community in the Netherlands between 1954 – 1961, not much has been written about him, nor Hermine. 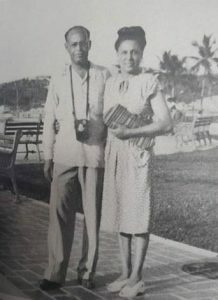 NUC is currently preparing an exposition on Otto and Hermine Huiswoud, so that people in the Netherlands can learn more about their historical role against imperialism.